Now UPDATED to be compatible with SMART Notebook 17! 50 interactive SMART Board pages in this SMART Notebook resource! 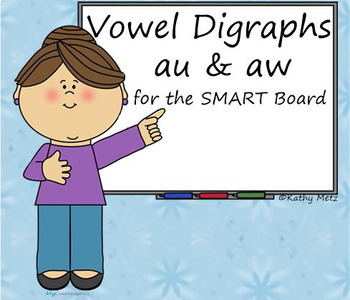 Introduce, practice or review the vowel digraph \au\ with your SMART Board! Ready to go! No prep! All you need to do is connect your SMART Board and you’re ready! 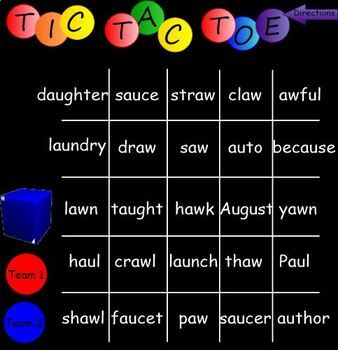 What a fun way for your students to learn about “au” and “aw!” My students love it and so will yours! 50 pages of SMART Board Activities to support your reading, phonics, and spelling instruction! Please note: This file uses SMART Notebook software. You should have this software to use the file. It is not compatible with other interactive whiteboard software such as ActivBoard (Active Inspire) or Promethean boards. •	3 SMART Board pages introducing vowel digraphs. 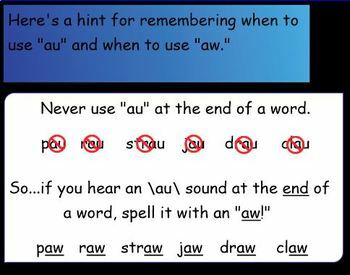 •	6 SMART Board pages on identifying the \au\ sound. 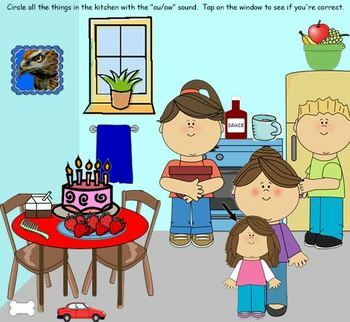 •	24 SMART Board pages on reading words with the au and aw spelling patterns. •	11 SMART Board pages on writing words with the au and aw spelling patterns. •	6 Title pages with quick links to skill practice. Within this unit students will learn about “au” and “aw” in isolation as well as in the context of spoken and written words. Students will explore blending sounds into whole words. Students will apply this knowledge while writing and reading new words. This unit supports a variety of different learning styles that naturally lend to differentiation. A variety of activities are available for student practice…just choose based on your specific students’ needs. You will also find the pages are either self-correcting or they have answer keys. Check out these other products too! Vowel Digraphs & Diphthongs for the SMART Board: The Two Sounds of "oo" & "ew"
This file uses SMART Notebook software. Please be sure you have SMART Notebook software before you purchase this product. It is not compatible with other interactive whiteboard software including ActivBoard (Active Inspire), Promethean boards, or Mimeo. It WILL NOT CONVERT from a SMART Notebook file to other interactive whiteboard software. This file has been updated to use SMART Notebook 17.1. It does not use Adobe Flash player elements.